Pivot Point Hair Pin Cotters are made exclusively to our exact specifications. Designed to be strong and secure, these fasteners are economical and widely used. It is important to select the correct size Hair Pins Cotter because misuse causes fatigue and will result in loss of the fastener. Consult our use chart below and ask us about proper hole size. We will be glad to help. Made from hard drawn MB spring wire, zinc plated and baked or Stainless Steel (300 Series). Also known as Hair Pins, Hair Pin Clips, Bridge Pins, Hair Springs, Hair Spring Clips, Hair Spring Cotters, R Clips and Hitch Pin Clips. 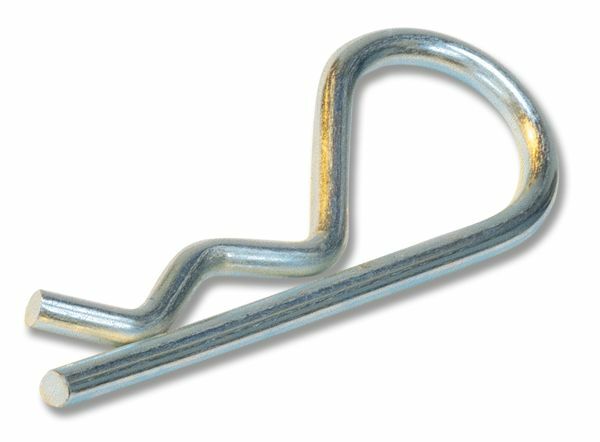 Hair Pin Cotters (or “R Clips”) are a spring-type cotter made to be reusable. Hair Pin Cotters are generally meant to be used in through-holes while Hair Pin Clips are generally meant to be used on a groove. Double Loop Hair Pin Cotters are also available. For more secure cotter pin options, try our popular locking cotter pin inventions- Bow-Tie Locking Cotter Pins or Rue-Ring Locking Cotter Pins.